In the 2013-14 school year, twenty-four states required students to be proficient on standardized tests in order to graduate from high school. But starting next year, and in the years to come, states will launch more rigorous, college- and career-ready assessments aligned to the Common Core. As they do so, they should revisit the stakes on these tests for students and consider eliminating, or modifying, their exit exam policies. As states transition to more challenging academic standards – with assessments to match those expectations – exit exams will increasingly place two worthy goals in conflict: motivating students to become college- and career-ready and giving them opportunities to access the world of college and career. 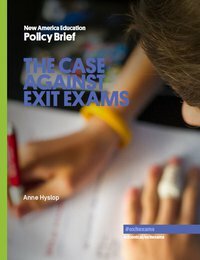 In making this choice, “The Case Against Exit Exams” finds that states run the risk of weakening the intent of the Common Core and undermining efforts to increase rigor, build stronger curricula, and authentically evaluate students’ postsecondary readiness. On their own, the college- and career-ready tests only aim to determine who is ready for college. But when used as an exit exam, they could now also determine who is able to go to college by earning a diploma. Because states cannot – and will not – suddenly deny high school degrees to large numbers of students, particularly those who are already at-risk and furthest behind, states will likely dilute the rigor of the college-and career-ready benchmark if meeting that score is tied to graduation requirements. These policies choices are imminent. “The Case Against Exit Exams” finds that as many as 21 states could continue their exit exams as they implement more challenging assessments, including 10 states that are using the PARCC and Smarter Balanced exams in high schools. The remaining 11 are opting to use tests unique to their states in the near-term, even if they are also governing members in one of the two consortia. The uncertain future of the consortia and/or the exit exam requirement in some states – including Arizona, California, Florida, Indiana, Louisiana, North Carolina, Oklahoma, and Tennessee – only amplifies the transition chaos for students and educators as new tests are unveiled. Further, exit exams may be one reason for states’ hesitation to adopt new high school tests, based on five state profiles created for the report: the Honor Roll, the Varsity Athletes, the Exchange Students, the Loners, and the Drama Club. Among states maintaining their high-stakes graduation tests, the report highlights six – Maryland, Mississippi, New Mexico, Ohio, Oregon, and Washington – that face the most nuanced and challenging transitions as they seek to maintain continuity in exit exam policies while making changes to the underlying exams. These states are now deploying strategies to minimize the risk to students during the transition to new tests, as well as the risks to the quality of the assessments if the scores are used for graduation decisions. These include phasing in new requirements gradually, only using the results from lower-level subjects as exit exams, and setting two distinct cut scores: one for graduation, and a higher one for readiness. While these strategies are a smart way for states to navigate the transition, the report concludes that states have other options, beyond exit exams, that allow them to pursue the dual goals of higher standards and higher educational attainment without pitting them against one another. For example, states should consider using standardized tests toward final course grades, or placing positive, rather than punitive, stakes on the results, such as automatic placement into credit-bearing courses at public colleges and universities. These policies avoid the costs of exit exams, like higher dropout rates for vulnerable students, without giving up on their benefits, including setting clear standards for high school learning, motivating students to reach higher standards, and providing a clear signal to employers and colleges that graduates possess valuable skills.